With Paul Williams Training Services you can rest assured that you will always receive professional and committed vehicle training, no matter what course you need. Whether you are a beginner or are looking for a refresher course, our driving instructors are available to work with you to get you a new licence. We are a private DVSA approved vocational test centre, giving you peace of mind that all training undertaken with us meets guidelines and regulations. The courses we offer include training for HGVs, LGVs, trailers, coaches and more. Our team of professionals work with you over the course of 4 hour sessions to help you to pass your licence tests. With over 20 years of experience in the industry, you can be sure to receive the training and support that you need. When it comes to gaining further vehicle training, our experts are the best around to help you develop the crucial skills that you need. 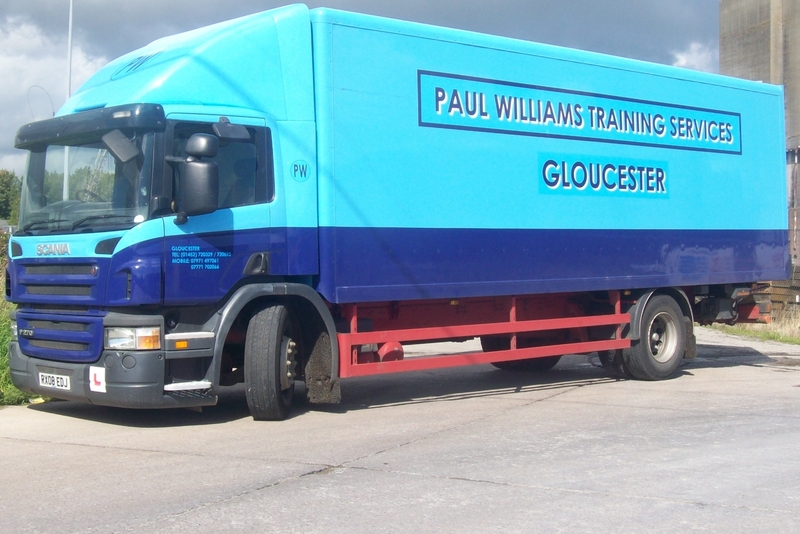 At Paul Williams Training Services we are on hand to help you to complete a range of vehicle training courses. For further details about the course we run and how you can book a place on one, give us a call today on 01452 720329. Category C+E artic courses are available at our training centre, giving you the chance to become qualified and skilled in this area. Artic can sometimes be referred to as class 1 or HGV (Heavy Goods Vehicle) and passing this course will allow you to drive the largest vehicle within this industry. To secure these courses you must already have passed a Category C licence, however no further medical or theory tests are required. The artic class vehicle that we have available to train in has the same gear box and cab layout as the Class C vehicle, reassuring you that you will be able to take to the training with ease. Our trailer is 36 feet long, has two axel on air suspension and is fitted with ABS (Anti-Lock Braking System). The large reversing area at our training centre gives you the perfect opportunity to manoeuvre a vehicle of this size. As coupling and uncoupling the trailer is now part of the driving test, we will also cover this with you to make sure you can do this safely. If you would like to upgrade from a Category C licence to a C+E, please do not hesitate to get in touch with us to book an assessment drive or a refresher course. A theory test for larger goods vehicles (LGVs) consists of two main sections, hazard perception and multiple-choice. There will be 100 multiple-choice questions to answer and you have 1 hour and 55 minutes to complete this. In order to pass, you require at least 85 out of 100. For the hazard perception you will watch 19 videos and aim to spot 20 developing hazards. The pass mark for this section is 67 out of 100 and you cannot review your answers once submitted. Once you have passed your test, you will have your theory test certificate posted to you and you will need this when you book your driver CPC part 3 test. Every theory test passed is valid for 2 years once you have gained it, giving you enough time to pass the practical element of your licence. If you do not pass your practical within two years, then you will need to resit the theory. To book a theory test you will need your UK driving licence number, email address or phone number, and a credit or debit card. We also offer training for Class D coach tests, providing you with the support and help that you need. The coach that we use for lessons is 12 metres long, has 55 seats, and a manual gearbox with 6 gears. Our training is usually carried out in the form of 4 hour lessons to give you the maximum time possible to get to grips with the driving. We run our sessions at 8.30 am to 12.30 pm and from12.30 pm to 4.30 pm. At your assessment day it will be determined how many days you need before you are ready to sit your test, ensuring that you know exactly how long it will take for you to pass. With a population of around 23,500, the town of Evesham has an 8th-century abbey, one of the biggest in Europe, and is well known for its market gardening. While in the area there are plenty of things to do for all members of the family, including a visit to the Workman Gardens, Abbey Park, and the Almonry Museum. Our training courses are available for anybody who is based in or around the Evesham area, providing you with the perfect place to get your training. To find out more about our courses and to book an assessment drive today, please give us a call. Our team are always on hand to help you to develop the skills that you need to drive any vehicle. You can call our team on 01452 720329 or fill in our online contact form.